Tom Brady and the “tuck rule”; “Nobody knew health care could be so complicated”; “The financial world has become way too complicated and very secretive.” What could Tom Brady, Donald Trump, and Michael Lewis possibly have in common? Complexity. Lewis has analyzed it; Trump has discovered it; Brady has benefited from it. And the USA is entangled in it. Complex systems are an inevitable part of business and socio-economic structures. We reach a breaking point, however, when social and organizational structures become cumbersome and unintelligible. Entire new systems need to be constructed just to manage this complexity, with questionable or negative value to society at large. The outcome is high costs, poor results, deepening social inequality, and the erosion of public trust. Wholesale changes must be contemplated. This is particularly true in the USA today, where complexity is piled upon complexity in a number of critical sectors, such as health care, energy, finance, and government. The author takes a common sense, broad-based, and analytical approach to some of the most complicated issues facing the US today. He examines the costs of complexity through a wide-angle lens, provides analysis of the root causes involved, and explains what is necessary to improve results and lower costs. The ever-increasing level of complexity in the US is compared to that in other developed economies. History is referenced as a guide to show that in many areas, America’s success has relied on simple and elegant solutions. These contrasting paths are used to propose alternative approaches and new solutions. 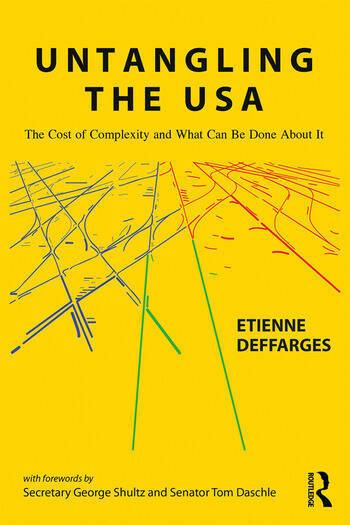 Beyond analyzing how incredibly complex socio-economic systems have emerged in recent years in the US, the author steps back, reflects on the fundamental values of this country, and offers a number of actionable proposals to improve the lives of all American citizens. Etienne Deffarges has enjoyed a successful career, first as a senior strategy consultant to many leading global companies, then as a heath care technology entrepreneur in the US. He is perfectly positioned to observe how complex systems are stifling socio-economic progress. He brings a unique insider view of the issues involved and examines a number of key sectors that impact American society at large, including health care, energy, finance, regulations, taxation, utilities, and welfare. Chapter 9: How Did We Get Here? Etienne Deffarges holds a variety of board positions with companies in aerospace, automotive, construction, energy, food, and health care. Previously, he was part of the founding team, EVP and Vice Chairman at Accretive Health (now R1 RCM); a global managing partner at Accenture; a senior partner with Booz Allen Hamilton; and a general field engineer with Schlumberger.